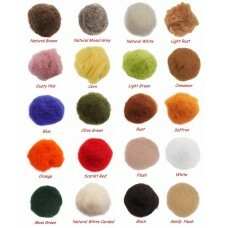 These wools are wonderful for needle felting and allow you to sculpture with much ease. This wool is the most BEAUTIFUL FLUFFY wool to felt with.... you won't believe it until you have tried it. It is so soft and bouncy and fluffy and does exactly what you tell it do with your felting needle. It is IDEAL for making felted figures, dogs, pictures (basically ANYTHING you wish to needle felt). When you purchase, please indicate the colour(s) that you want by selecting the colour from the available options for Italian Carded Wool Colour above (or by leaving a Comment at the check-out). Please note that the natural wools (brown, mixed grey and white) may contain traces of dirt and organic matter as they are completely natural and although they are washed some particles may remain. Please note that colours may vary slightly with different batches and from the photos. Remember, combined postage discounts improve the more you buy. Arrived in Canada in 12 days! Roving looks lovely! Beautiful felting wools, excellent customer service, very fast dispatch !